About 24 Kms from Haridwar. Located in the laps of lower Himalayas, and is surrounded by scenic beauty of the hills on three sides with Holy Ganga flowing through it. The whole place is considered to be sacred as it is believed that meditation at this place leads to attainment of salvation. There are many temples-some ancient, some new along the river Ganges. 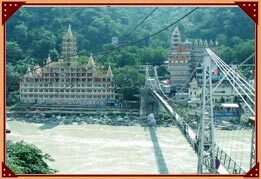 Rishikesh is important not only as pilgrimage centre closely associated with the Ramayana, but also as home for many important centres of Hindu religious thought and spirituality, and as a very great Yoga Centre. There are a great many ashrams and Yoga institutes here. 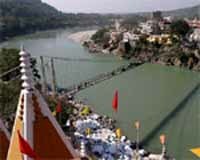 Rishikesh is also the gateway and the start-off point for journeys to important religious places like Badrinath, Kedarnath, Gangotri, and Yamunotri. Rishikesh is also acquiring greater significance as a centre for white water rafting, other revering sports, a base for treks and hikes in the beautiful Garhwal Himalayas. 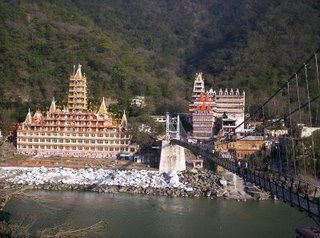 Rishikesh is an ideal destination not only for pilgrims but also for those who want to delve deeper into meditation, Yoga and other aspects of Hinduism. For the adventurous, Rishikesh is the place for starting their trekking expeditions and excursions towards the Himalayan peaks. The International Yoga week, which attracts participation from all across the world, is held here every year from 2nd to 7th Feb on the bank of Ganga river. Rishikesh may be famous for Ashrams where you can learn Yoga and meditation or rafting, but even if you are not upto all that, you can still have a good time there. Take a walk around the beautiful bridges of Ram Jhula and Laxman Jhula, buy wheat balls and feed them to the Masheer fish which can be found in big groups in Ram Jhula, shop for some stones, gems or necklaces, and much more. 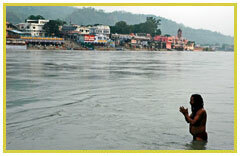 When the sun is high and it is not cold, take a dip in the Ganges if you wish, or just sit back and watch it flow. Move a little away from habitation and you can go spotting Indian Grey Hornbills, Jungle Babblers and many more interesting birds. When you are tired of all that, head to one of the many multi-cuisine restaurant that can serve you many kind of food, including Italian, Arabian, European, North and South Indian. Come evening and head for the Ganga Aarti and spend time singing Bhajans and performing the Aarti, or just watching the rituals. It is easy to spend a few days in Rishikesh doing little else but walking around, and still feel that you can go on to stay longer. The place has a charm and is worth experiencing it. 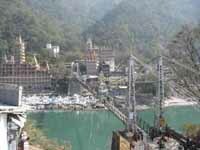 People primarily visit Rishikesh to learn or practice Yoga and meditation. Occasionally called the 'Yoga Capital of the World', you have many Ashram or independent teachers teaching Yoga in Rishikesh. It shot to fame in the west in seventies, when Beatles made a journey to the Ashram of Mahesh Yogi in Rishikesh. It is three decades since, but is an event still talked about and associated with the place. 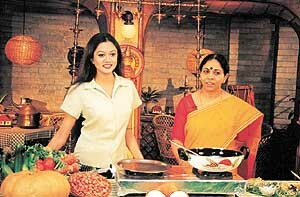 One can also find classes on music and other fine arts along with Yoga. There are several Ashrams around Ram Jhoola and Laxman Jhoola, along the banks of Ganga, where one can stay and learn meditation and Yoga. While Ashram stays would be preferable for serious students who can stay on for a long time and practice, others can stay in nearby hotels and take short courses. For the serious student, Mark Barian's book - Roar of the Ganges provides some good insights. Other than Yoga, Rishikesh has picturesque landscapes formed by Ganges emerging into the planes from Himalayan foothills. 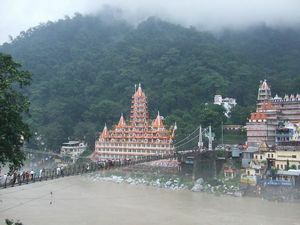 Few large temples can be visited near Laxman Jhula. Rafting is another activity that Rishikesh is known for. Many adventure companies are located upstream from Rishikesh where you can stay in tented accommodations, trek, do rafting and some more adventure activities. 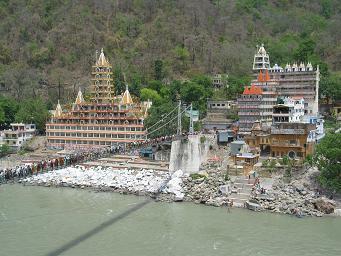 Rishikesh is around 230km from Delhi and takes approximately 8 hours from Delhi by Bus or Train. It is around 30 minutes drive from Dehradun's Jolly Grant Airport. Nearby places of Interest: Rajaji National Park is very close to Rishikesh and can be reached in 30 minutes. The park has a few tigers and many elephants, and is a treat for those interested in bird watching. Visitors can hire a jeep and go on a safari or take elephant rides. Contact GMVN for stay options in Rajaji National Park. 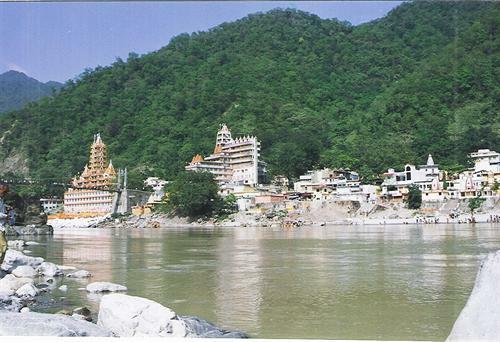 Haridwar is another holy city close to Rishikesh where you can stay in Ashrams to learn Yoga or meditation. Haridwar's Ganga Aarti at Har ki Pauri is popular and draws large crowds everyday. Mussourie, a well known hill station is a 2 to 3 hour drive from Rishikesh. For those looking for rafting and adventure, many travel agencies at Rishikesh can make bookings make arrangements. GMVN conducts rafting trips that start from Kaudiyala.